Crime is higher near downtown Spokane homeless shelter, and businesses are fed up. The relationship between business owners and the chronically homeless, who spend much of their time in the six-block radius near Pacific Avenue and Division Street downtown, has reached a boiling point this summer, leading many to speak out for the first time since the House of Charity switched to 24/7 services in 2016. MOUNT VERNON – After Friendship House’s recent decision to at least temporarily reduce the number of meals it serves to the homeless, neighbors of the nonprofit hope it’s the beginning of a solution to problems they say have grown with the number of homeless people coming through the area. Neighbors contend that the Friendship House Cafe’s free meal service has concentrated the homeless population in their neighborhood and that a subset of that population commits crimes on their properties. Some business owners along South Third Street, south of downtown, have reported finding needles on their property and finding people loitering or sleeping on their lawns. “It’s really ramped up in the last year,” said Susan Fraley, administrative secretary at the Mount Vernon School District’s Special and Support Services building. At 8:30 a.m. each day, when she gets to the office about a block from Friendship House, she circles the building looking for evidence of criminal activity. She said needles, litter or feces are found daily on the property. It isn’t uncommon to see drug dealing, fights or combative behavior from homeless people, she said. Working in the school district’s Special and Support Services office, Fraley said part of her job is to help students and families feel safe while she connects them with special education and other services. She said her office serves several homeless children and families, and the law-abiding community members aren’t the problem. In response to neighbor complaints, Friendship House decided Aug. 15 that it would try cutting breakfast and lunch from its menu – and only offer dinner – starting Sept. 1. The nonprofit’s board made this decision after a group of neighbors suggested it, said Tina Tate, executive director of Friendship House. Tate and Mount Vernon Police Lt. Greg Booth are also meeting twice monthly to share information on people Friendship House identified as troublemakers. But most agree that law enforcement alone is no solution. Mayor Jill Boudreau said her office has also been in talks with both Friendship House and the business community. That has to be balanced, however, with the needs of the community that Friendship House is serving, she said. Data from the police department shows an increase in 911 calls in a two-block area around the cafi, said Booth, who is in charge of crime prevention. Police calls dropped from 296 in 2014 to 206 in 2015, but since then, calls have increased annually, to 304 in 2017, police records show. This year, calls are on track to reach 350, he said. In that same time period, Friendship House went from serving 5,400 meals per month to 6,800, according to data from the nonprofit. “We’re having issues with the whole downtown area . but this (neighborhood) seems like a focal point,” Booth said. The statistics don’t necessarily tell the whole story, though, he said. The department came into the neighborhood to meet with stakeholders earlier this summer, and Booth told them to call the police whenever they see criminal activity, even if it’s unlikely they can help, so that officials could get a better sense of activity there. While his invitation might account for some additional calls, Booth said it’s also clear that criminal activity in the area has increased, based both on call volume and what he’s heard from neighbors. In response, the department decided in June to emphasize patrols downtown and near South Third Street, having officers walk the beat and meet with residents and business owners. “We’re just being a more visible and consistent presence there,” he said. The mayor and City Council have been working this year on a plan to respond to common criminal activity in the homeless community, an inter-departmental plan called the Problem Elimination and Reduction Team (PERT). Peter Donovan, project development manager with the city, said the PERT plan aims to make it more efficient to address things such as homeless encampments, illegal RV parking and trespassing on private property. “This is to address the small percentage of bad actors (in the homeless community),” he said. As part of this plan, Donovan said the city plans to hire a park ranger to patrol parks and some public areas downtown. The PERT plan is a reaction to what the city has heard from businesses and residents downtown and near Friendship House, he said. What it doesn’t address, however, is causes of homelessness. Michelle Antonich, who co-owns the Skagit Family Health Clinic, said that homelessness, and the criminality that can be associated with it, won’t be fixed by law enforcement. But she also has customers who have told her they’re afraid to visit that part of town. “What we have now is unsustainable,” she said. In one instance, Antonich said someone caused more than $10,000 of damage to the clinic building after breaking a water spigot that flooded the basement. The issues aren’t just occasional, she said. “Some (weeks), we have to call the police every day,” she said. Antonich said she doesn’t have solutions but is encouraged that Friendship House is trying something. While she isn’t confident that a reduction in meal service will eliminate the problems, she said she hopes the nonprofit participates more in neighborhood discussions, perhaps forming an advisory committee so solutions could be found collaboratively. Antonich said the majority of law-abiding homeless and struggling people will likely be hurt without access to breakfast and lunch, and it isn’t fair to penalize them for the actions of others. “But there are a lot of things in general that aren’t fair,” she said, adding that her employees have to deal with the waste left on her property. Neighbors met in June and again in August to discuss the problems they’ve been facing, said Jim Fikkert, pastor at the Communion Church near the cafi. Fikkert has been a spokesman for the neighborhood businesses on this issue. “There’s a destructive attitude that descends on the neighborhood during meal time,” Fikkert said, adding that while he believes a minority of homeless people causing problems, that group appears to be growing. He organized the meetings in part to let people vent their frustration but also begin talking constructively about potential solutions. After the August neighborhood meeting, Fikkert approached the Friendship House Board of Directors with the proposal to reduce meals. According to Ellen Gamson, executive director of the city Downtown Association, these problems aren’t exclusive to businesses near Friendship House. She said many businesses downtown have reported finding needles, feces and vandalism. “It’s detrimental to people’s desire to come downtown and do business,” she said. The police patrol emphasis has helped business owners feel safer, but police are limited in what they can do in response to these crimes where there’s often no way to find out who is responsible, Gamson said. “The city’s been as responsive as they can be with current staffing,” she said. 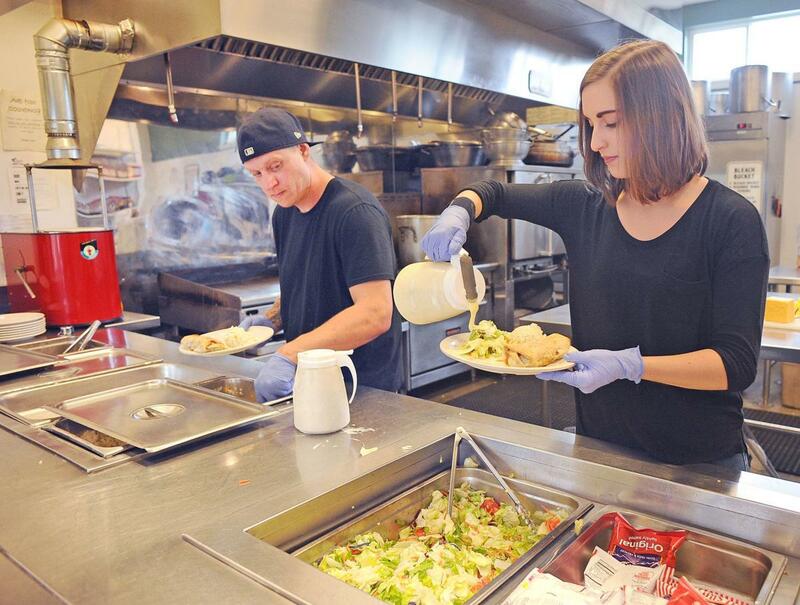 Fraley said she believes Friendship House’s meal service helps the subsection of the homeless population that is compelled to commit crimes by allowing them to keep living on the street. “If you’re given three meals a day, no questions asked, you have no incentive to change,” she said. She said if the reduction in meals leads to a reduction in crime near her office, she will be happy to see it. Some who regularly use the cafi are skeptical of the possible effects of changes to meal service. Once those who are causing problems are cut off from some of their meals, Yandle said she anticipates they’ll get desperate, and crime in the neighborhood could get worse. Friendship House will evaluate the effects of reducing meals after 90 days, taking into account crime data and input from the neighbors, Tate said, acknowledging that there has been growing tension over the situation. Whether this plan will adequately address the concerns remains to be seen. “There’s only one way to know for sure,” Tate said. The change in meal service is worth a try if it helps the nonprofit be a better neighbor, she said. After 90 days, Tate will review crime data with law enforcement and talk with neighbors about how effective the one-meal-per-day plan has been. In the meantime, the nonprofit is working to find an off-site location to serve sack lunches, she said. However, she rejects the claim made by some that Friendship House attracts homeless people from outside the county. Most are Skagit County people without homes, she said. About 80 percent of those contacted in Community Action of Skagit County’s annual point-in-time homeless count said their last known address was here, Tate said. Ultimately, nothing will be truly solved until the community and local governments invest in more homeless support services and affordable housing, said Bill Henkel, executive director of Community Action of Skagit County. That organization serves some of the same people as Friendship House, though with different types of services. “The tools we lack are a well-situated day center, more emergency shelter resources and permanent supportive housing,” he said. If the county had the right tools available earlier, it’s likely that the homeless population wouldn’t be so concentrated around Friendship House in Mount Vernon, and any negative side effects would be more dispersed, Henkel said. Tate said she hopes the conversation between Friendship House and its neighbors may serve as a catalyst for new and better services. “My vision and my dream, personally, is for Friendship House to make a big move to provide more services in a better way,” she said. It’s possible that this incident will be the start of a community-wide conversation about the needs of the homeless population across the county and what can be done to address them, she said. “The need has grown to the point that (what we’re doing) is not enough,” she said. Published: Sept. 2, 2018, 11:30 a.m.